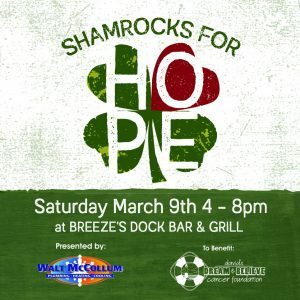 The 3rd Annual Shamrocks for Hope presented by Walt McCollum Plumbing, Heating and Cooling to benefit David’s Dream & Believe Cancer Foundation will take place on Saturday March 9th at Breeze’s Dock Bar and Grill, in the Viking Yachting Center, in New Gretna, from 4-8pm. The event is family friendly. In 2017, Patient Advocate Susan Buzby wanted to create and manage a new event in order to “Pay Forward” the same kindness, generosity of spirit and love that her family received during her own battle with cancer. 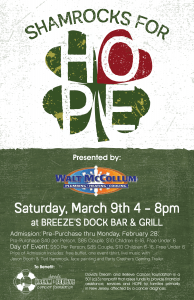 Tickets can be Pre-Purchased through Thursday February 28th (Extension thru Monday March 1st 11:59pm) by clicking HERE. A ticket will include: Free Buffet, 1 event t-shirt (Jetty Printed event T-Shirt Guaranteed with Pre-Purchase Only), Auction, Live Music with Jason Booth & Ted Hammock, Face Painting and Party Crashers Gaming Trailer. Pre-Purchase thru Thursday February 28th or until Sold Out: (Extension thru Monday March 1st 11:59pm) Adults 17 & Over: $40, Couples: $65,Kids 6-16: $10, Children 5 & Under: Free.